The research of the Frey group focuses on collective effects in the dynamics of complex systems. We are interested in how the interplay between stochastic fluctuations, interactions, and geometry shapes system-level properties and their functional characteristics. A central goal of our research is to identify and characterize universal action principles, and thereby develop a mechanistic understanding of system features. To this end analytical and numerical methods from non-equilibrium statistical physics and nonlinear dynamics are used and developed further. For a popular account of our reserach interests please refer to the newsletter of LMU Munich insightLMU. Intracellular positioning of proteins is important for several vital processes in bacterial cells, including cell division. 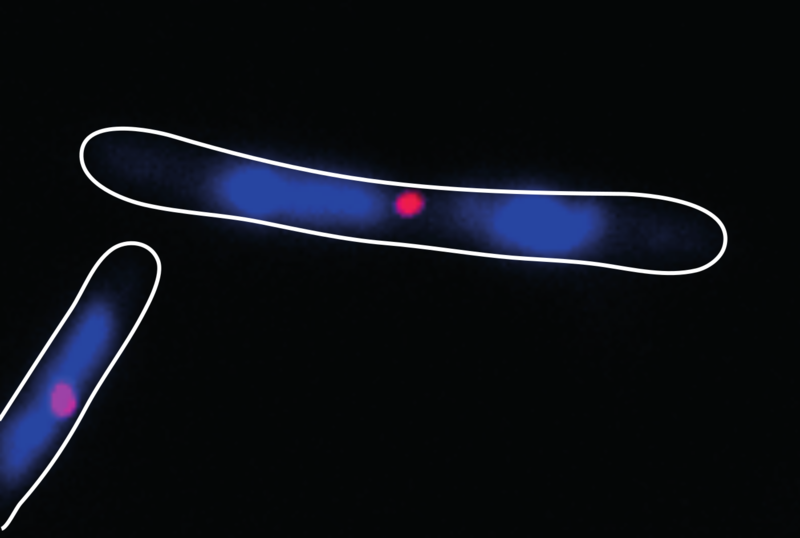 Bacterial cells generally divide symmetrically by forming a contractile ring, which is progressively constricted to form two daughter cells of equal size. An important question to address is how a bacterial cell can identify mid-cell to divide there. In our work we have developed a mathematical model that explains how the plane of division is specified in the rod-shaped bacterium Myxococcus xanthus. Life relies on the emergence of order. Understanding this unique ability of living organisms to self-organize their constituents into functional ensembles is the declared central objective of active-matter physics. Recently, several breakthroughs have demonstrated that principles of active matter are indeed capable of describing the emergence of robust types of macroscopic order, such as topological or defect-dominated states in cells or tissues. Molecular motors of the kinesin-8 family are important regulators of the length of microtubules, filamentous polymers which play vital roles in chromosome segregation and molecular transport. In our work we have addressed the question how length regulation functions in compartments of finite size, i.e., when the availability of protein is limited. Complex systems in biology, chemistry and physics are in general nonlinear and far from equilibrium, intricately coupled and heterogeneous. Why then do they not simply collapse, run out of control or become chaotic? The canonical theory of pattern formation deals with nonlinear systems that are near a global equilibrium state and where nonlinear interactions have a stabilizing effect. However, in the real world this is rarely the case: collective effects in biological, ecological, or economic systems, can lead to sudden, dramatic changes in the dynamics. Entropy and topology are major determinants of the complex dynamics and emergent behaviour of soft matter systems. In particular, the correct description of the release of topological constraints still poses a major challenge in almost any such system. In a series of seminal papers, de Gennes, Edwards and Doi formulated the reptation theory of entangled polymer solutions, which has become a paradigm in the field of soft-matter physics. Length regulation of microtubules (MTs) is essential for many cellular processes. Molecular motors like kinesin-8, which move along MTs and also act as depolymerases, are known as key players in MT dynamics. However, the regulatory mechanisms of length control remain elusive. Here, we investigate a stochastic model accounting for the interplay between polymerization kinetics and motor-induced depolymerization. We determine the dependence of MT length and variance on rate constants and motor concentration. Moreover, our analyses reveal how collective phenomena lead to a well-defined MT length. Reaction-diffusion dynamics provide a versatile framework for intracellular self-organization phenomena. The Min system in E. coli employs such mechanisms to ensure precise cell division by its ability to dynamically adapt to cell geometry. Under which conditions patterns emerge, how patterns are regulated by cell shape, and how such systems can be investigated in cellular geometries are the major aspects considered in our work. Microbes providing public goods are widespread in nature despite running the risk of being exploited by free-riders. However, the precise ecological factors supporting cooperation are still puzzling. An astonishing biodiversity exists within the earth's ecosystems. While being of essential importance to the viability of ecological systems, conceptual explanations of such diversity pose major challenges. Indeed, in a naive understanding of Darwinian evolution, two interacting species would compete for resources until only the fitter one survives (competitive exclusion principle). Non-hierarchical competitions between species have been found to help resolving this apparent paradox, and promote biodiversity.